Insight reports are not enabled by default for data sets. If you're interested in having general, monthly or quarterly insights for one or more of your data sets ask your contact at Thematic. An insight report is a Thematic curated set of interesting or important discoveries from analyzing a data set. Insights focus on either all of the data or one time period in the data compared to the previous. Open your insight reports using the Report drop-down menu in the navigation bar. A data set's insights report will be named after it ie. "NPS Survey Insights" or "CSAT Survey Insights". Insights will be grouped under headers and more recent headers shown first. You can mouse over each graph to see more details and click the explore button to go to that analytic tool with the filters applied. 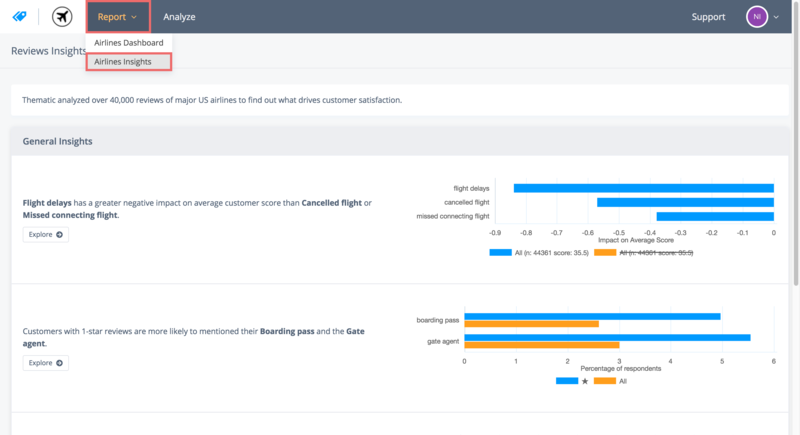 Highlighting the most meaningful insights from your data with clear sentences explaining the insight and numbers involved.